Well, now that the dust has settled and things are mostly back to normal–as normal as things get around here, that is–I’m back at it, and banged out around 4,700 words last night on the latest book. I have to finish it by December 3, as that’s when I’m supposed to release it to the editor. Of course, it’s only 65% done, but hey, I’m up for it. I was going to release Tribes as my next book, but it wasn’t coming along all that well for me, so I’ve tabled it for the moment until I can figure out how to make it more exciting and fun, something which has eluded me for some time. I like the general story, about researchers at the South Pole uncovering something from the distant past that has a great amount of value in the present day, valuable enough to finally push the United States into direct conflict with the happy People’s Republic of China with our intrepid researchers caught in the middle (and where their outpost is suddenly ground zero between U.S. Army Rangers and Chinese Marines), but while the framework is there, I’ve had a lot of trouble building up the body mass that such a story should sport. So, Tribes is out of the running for the nonce. But reaching into my vast collection of old stories, scripts, and half-completed novels, I pulled out a work that thrilled the socks off me when I first wrote it. In 1983. It’s a post-apocalypse science fiction adventure script called Earthfall, which I’ve been busily converting into a standalone novel. It takes place in the not-so-distant future where an unforunate nuclear exchange between the U.S. and a resurgent nationalist Russia pretty much altered the course of human history, as the detonation of several hundred nuclear weapons will do. The U.S. had a sustainment plan since the Reagan years called Harmony Base, a subterranean facility buried several hundred feet below the surface of western Kansas, where a mixture of civilians and military types essentially shelter in place for a decade before emerging from the base to rebuild and renew. A freak accident places the installation in jeopardy, and a team of explorers is dispatched to distant California, where they have to locate items that can restore Harmony Base to functionality–otherwise, everyone in the base will kick the bucket in two weeks. Readers of The Gathering Dead series of books will instantly identify Command Sergeant Major Scott Mulligan as Gartrell’s progenitor. Like Gartrell did in the Dead books, Mulligan carries the dramatic weight of the story, a fifty-something warrior who is tasked to carry out one final mission in a world that’s just not as lifeless as it looks. I liken the work to The Road Warrior meets Damnation Alley with a little of The Hills Have Eyes thrown in for good measure. It should be released in ebook and print in the middle of December. And after that, I start winding up on another McDaniels/Gartrell ouvre with some support from Sergeant Jorge Roche, presuming I can come up with a suitable story. That’s all for now, folks. Next up, an update on The Gathering Dead film. Stay tuned. So my absence as of late has been driven by a great many things, but none of them are as imposing as the passing of my father, Russ “The Weird Beard” Knight. 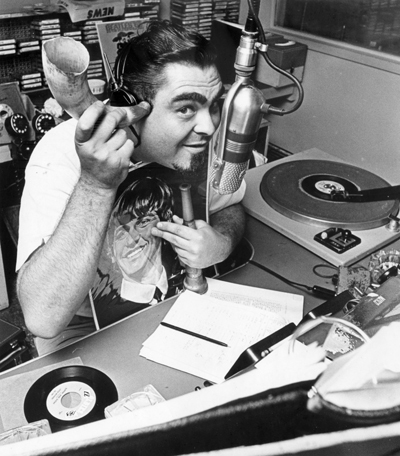 Residents of Dallas and Houston might know the name–back in the early to mid-1960s, The Weird Beard was one of the cornerstones of radio, covering the 7:00pm to Midnight shift. He was a pretty famous guy back then, and he was all over the place while working at Dallas’s KLIF and Houston’s KILT (I always have to check to make sure I didn’t type KLIT). Older folks from the area might have had the opportunity to hear the Beard-Man work his mystical magic over the silver airwaves, cranking out hit after hit while speaking in his rapid-fire, all-too-groovy patter where just about everything he said rhymed. Being a popular gent that he was, Dad hung out with a whole slew of cool cats–I awoke one morning as a youngster to discover none other than Roy Orbison crashed out on our couch, for instance, and later in life I met Kenny Rogers and his elder brother, Leland, more than once (I never got to know Kenny very well, but Leland was great fun; just the same, both of them are recalled by me as kind, gentle men). He also hung out with some genuine crackpots, one of them being none other than Jack Ruby, and this association led to my Dad testifying before the Warren Commission. In the history of radio, Dad had one of the highest market shares ever recorded–62%, during his time at KLIF in Dallas. His crowning achievement, the one he was most proud of, was introducing The Beatles to Houston in 1965. You can find clips of Dad trying to control the crowd on YouTube, and it’s hilarious to listen to (“Settle down, now!” was something my brother and I heard often). For decades, he had a green steam trunk full of Beatles memorabilia that we lugged around from state to state–all the Fab Four’s autographs, candid photos, a pair of Ringo’s drum sticks, some bootleg recordings and unheard interviews. It was apparently stolen during a move in the late 1970s–I would suspect one of the movers opened the trunk, recognized what lay inside for the treasure it was, and boosted it. Dad fell ill a few months ago, and while his health was certainly taking a turn for the worse, his death happened within days. But when he died, I was holding his hand and looking right at him when he passed away. I have no idea if he was aware of my presence, but I think that part of the deal was as good as it could get. I was there, as was my brother, along with my stepmother and one of my stepbrothers. My mother was in Texas, and there just wasn’t enough time to bring her up. He died at a little past 8:30pm on Friday, October 12, 2012. So now, I’m moving on…getting back to life, getting back to writing, repairing fences and having trees cut down before the next hurricane moves in. Things are getting back to normal, and I’ll be heading to Texas next week for Thanksgiving. Life continues. But when the night is deep and black, I lie in my bed staring at the darkened ceiling…and once again, I’m a little boy who misses his daddy.